Wow, I am REALLY behind on my Blog Posts! My apologies. It’s been an amazingly busy Spring/Summer for cakes around here. So much so that my family didn’t even get around to booking a vacation because there literally wasn’t a week that we were all available. So. 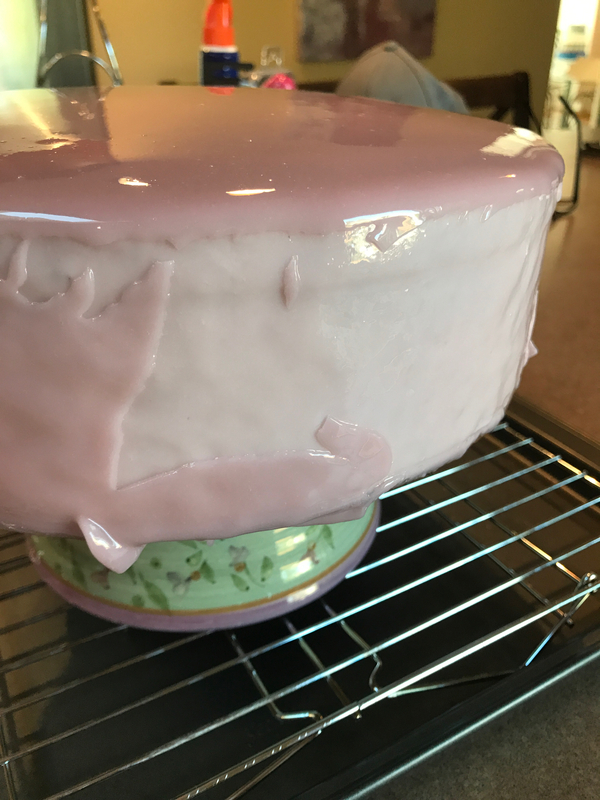 We will play catch up another time but for this post I wanted to teach you what I’ve learned about Mirror Glaze Cakes. Those are the really shiny cakes made from a chocolate glaze that have gelatin in it. Let me start with this – MIRROR GLAZED CAKES ARE NOT VERY FORGIVING! – They are basically a one shot deal because they NEVER completely dry and remain sticky, making them a dangerous medium to be near your arm, your hands or anything else that brushes past them. If you catch it, it will come away from the cake. They are gorgeous, however, and that is why we love them. What I mentioned above is basically what happened with my wedding cake that was due last Wednesday. And it happened THE MORNING OF THE WEDDING! YUP. You heard that right. Basically my worst nightmare. Let me walk you through it. 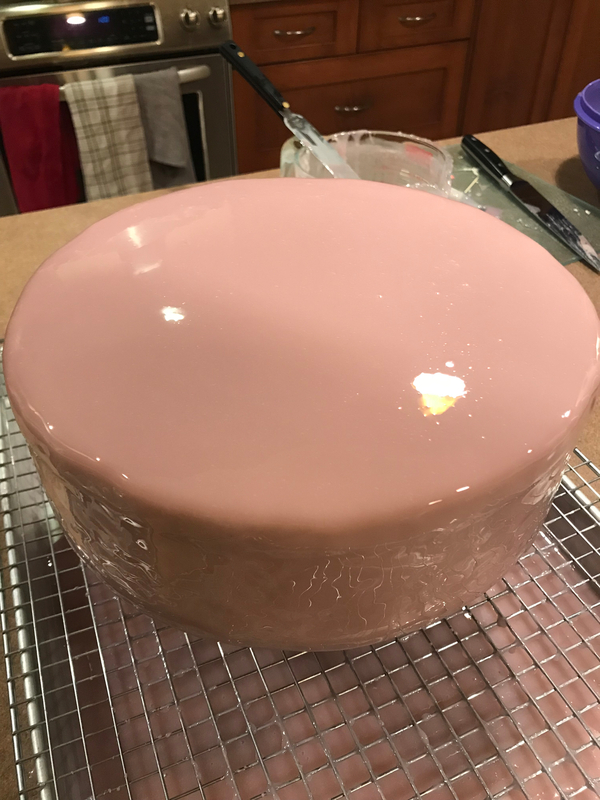 The night before the wedding I poured my mirror glaze onto my frozen entremet (an entremet is a mousse cake and it NEEDS to be frozen before you pour the glaze or you will melt the mousse from the warmth of the glaze itself) and stuck it in the fridge looking all beautiful. But then, the next morning, this happened: YIKES! I thought that the glaze had slipped overnight in the fridge but soon realized that the parchment paper I had laid underneath it had rolled up onto the back when I pulled it OUT of the fridge, tapped the cake and pulled the glaze away with it. No problem, I thought. I had saved the leftover glaze so I just gently reheated it until it was 35 degrees (C) and thought I will just re-pour it to fill in the gaps, then pour a second time to cover it evenly again and remove any lumps. What is one thing people tend to do under moments of stress? NOT THINK STRAIGHT! 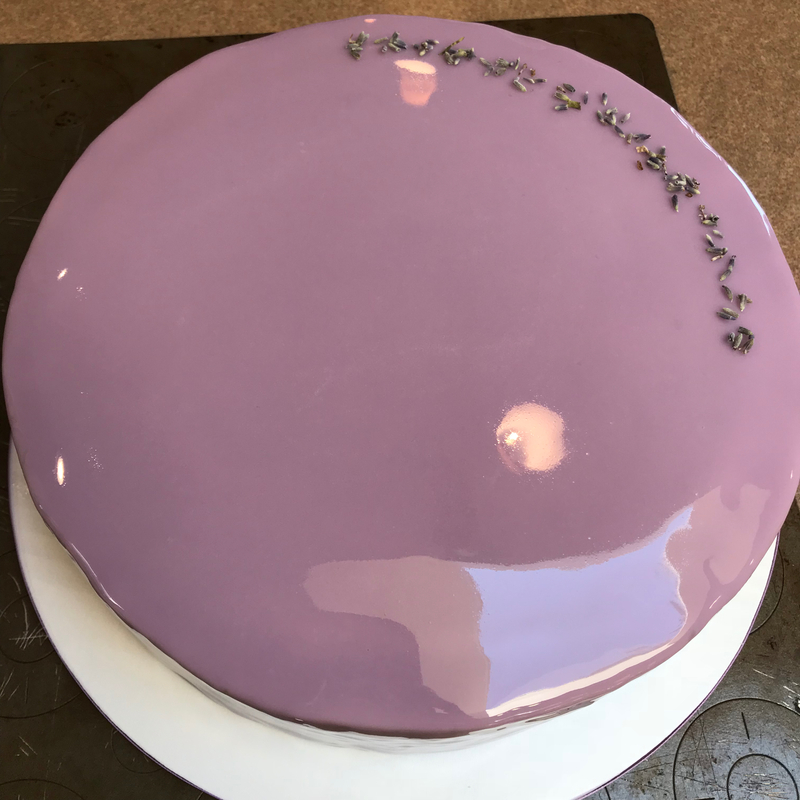 Entremets need to be frozen when you apply your glaze. Which this one was the day before when I did it. But this time in my moment of panic I forgot it had just come from the fridge. 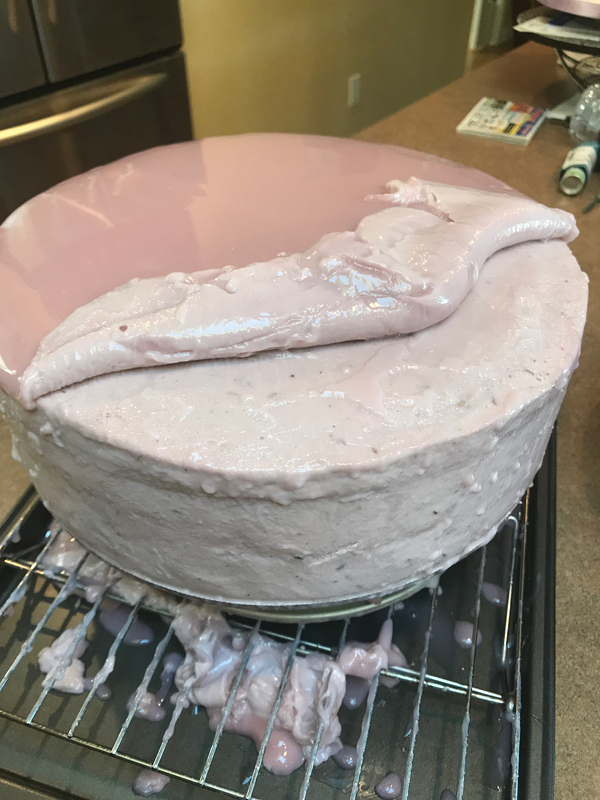 After pouring the glaze over this unfrozen mousse cake, the second layer stuck to the first layer, started to melt the mousse underneath, and proceeded to pull ALL of the glaze off of the cake. And where it didn’t pull the glaze it ‘globbed’ up leaving blobs of unsightly gelatine all over my cake. Wondering what i did next? Ran down the hall and started crying. Yes, sad but true. This was the MORNING of this wedding and I had to leave my house in two hours to make delivery. I actually believed for the first time in 10 years that I may not be able to fix this cake. My mind started racing to what I would tell the bride, her parents, what could I quickly buy and stick on the cake table etc. etc. But after many tears and the same amount of prayer I had a thought. (Thank you LORD!) I put the messy cake into the freezer and waited. About half an hour. Then I opened the freezer and with a sharp knife in hand (with cake still in freezer) I carefully started to cut lines around the top edge of the cake. The mousse at this time was re-frozen so it allowed me to experiment to see how I might remove the glaze. Imagine how excited I was to learn that when frozen like this, the glaze could be rolled off of the cake and leave the mousse intact!!! I actually had no idea that would be the case but I had no choice at this point but to experiment. So that’s what I did. I stood in front of my freezer, rolling off the sticky gelatinous mess until all I was left with was the blank canvas of mousse once again. Once this was done I smoothed the outside of the mousse with a palette knife and let it re-freeze for about 45 minutes until I had a perfectly frozen entremet once more. Once frozen I simply re-poured the glaze over top and DID NOT TOUCH IT until it was taken to the wedding site. Problem Solved!